KEEPING up with the Varadkars? On Friday for lunch, no one can keep up with magnificent Miriam Varadkar. The domestic goddess practically races around the dining room table of the family home in Blanchardstown — doling out ham, turkey, carrots, potato salad, tomatoes, coleslaw, green and black olives onto plates, ably assisted by daughter Sonia, to all and sundry. Her husband, Dr Ashok, sits at the top of the table. To his right, is the man-of-the-moment, their son, Leo. Beside him again are his two seven-year-old nephews, unidentical twins Eric and Alex. 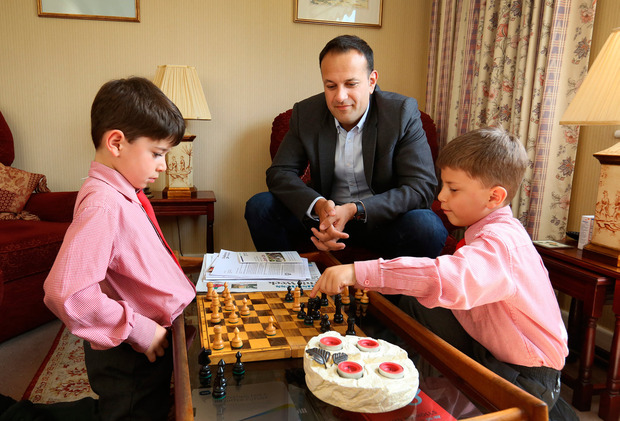 Eating up his ham for his adoring mammy, Leo’s talk isn’t of his present battle with Simon Coveney for the leadership of the country — for the heart and soul of Fine Gael — but of another much more epic “battle”. This particular fight to the death had a certain inter-galactic theme and was fought on Christmas Day two years ago here in the Varadkar family home with young Eric and Alex. “I think I was playing Princess Leia’s son…” laughs Leo. “But I was more of a Star Trek fan growing up. I was more of a Trekkie,” corrects Leo, who lives around the corner from Sonia. “It was like a pajama top on me!” laughs Leo. Miriam remembers Leo going to Montessori and how he “hated the walk up Delwood Road in the cold and wind”. “Miriam would give in on bad days and let him skip school,” Sonia says. Leo’s other sister Sophie, who lives in London, had earlier told me that her younger brother was “a very gentle, thoughtful child. He loved his teachers in Montessori, especially Madeleine and Cathy”. The latter first recognised Leo’s intelligence “and used to have long conversations with him”, says Sophie, adding that from a young age, Leo “always had a steady and loyal group of friends. And again in secondary school, he had a group of good friends”. Miriam, who has taken a break from making sure everyone has enough to eat, sits down and recalls the morning Leo made his Holy Communion. He had to run down to his best friend and neighbour, David Kelly. “I think it was the year Johnny Logan won the Eurovision and,” says Leo, “I think I was dressed like him. It was a white suit.” And it was ruined. Separation anxiety, notwithstanding, ‘The Blanchardstown Boy Wonder’ did more than OK, going to fill various ministerial posts in Government. In his early days in the Dail, newbie Leo wound-up former Taoiseach Bertie Ahern by quizzing him over his finances, before tearing into Brian Cowen. “Bertie called me a pup on the radio!” he laughs now at it all. And despite being part of the attempted heave against Enda Kenny in 2010 it wasn’t the end of young pup Leo’s political career. “Everyone gave up on him,” continues Sonia, “but I didn’t. This is remarkable for other reasons, as his mother points out. Miriam recalls bringing Leo to swimming lessons as a very young boy and giving up, “because he would come out of the water — and he would be crying. I would just wrap him up and bring him home”. Leo’s other sister, Sophie, took him weekly to the nearby Coolmine Sports & Leisure Centre for swimming lessons where “he did his best to hide his fear and he did learn; and in fact is now an excellent swimmer”. These skills lamentably didn’t extend to the home front. 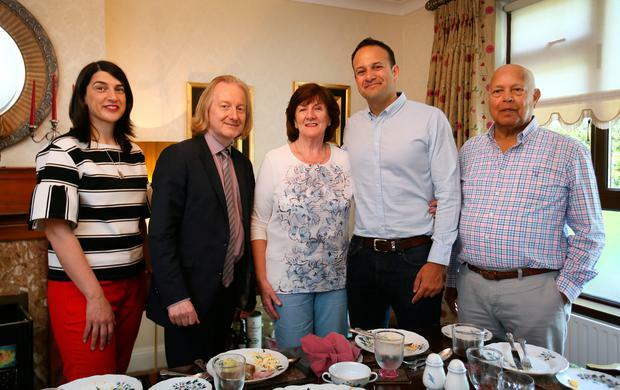 In 2011, RTE’s The Naked Presidential Election documentary showed an exhausted Leo arriving home at night to an empty apartment and putting a profoundly forlorn-looking ready meal in the microwave. Have you lost the fear of the target on your back now? “It’s amazing that people were talking about me as a future leader back in 2011,” Leo says. “I think the funniest one was at The Glenties [The MacGill] Summer School two years ago when I talked about indexing welfare benefits and RTE reported it right away as a leadership bid. Of all things that excite the Fine Gael base, it is not the intricacies of welfare policy!” he laughs. Leo and his boyfriend, Dr Matthew Barrett — who is in Prague doing a medical exam — appeared to have understood the intricacies of keeping out of the spotlight since their relationship became vaguely public knowledge last year. 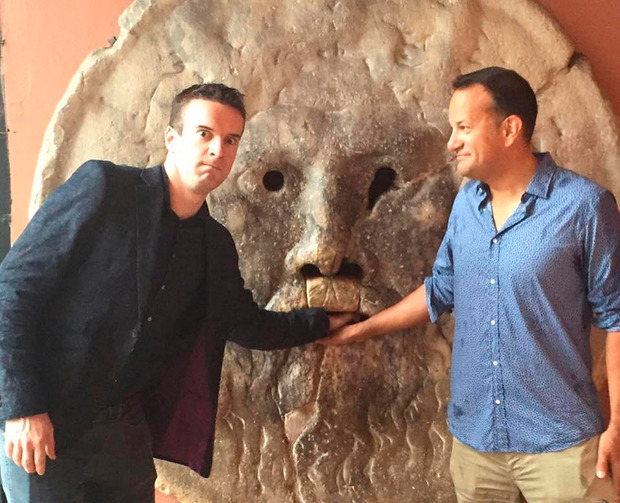 That could surely all change should Leo become Taoiseach. Presumably, as leader, you would bring Matt to State occasions like Enda Kenny brought Fionnuala to meet world leaders etc? “No. That wouldn’t be my plan,” Leo says. “First of all, we’re not married. 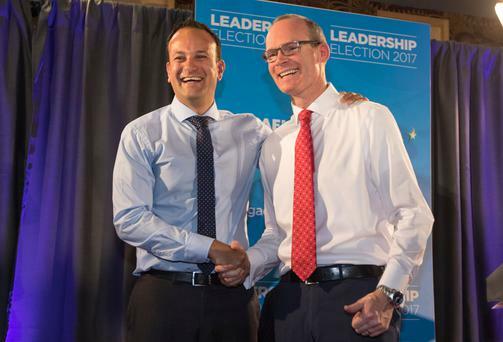 We’ve only been going out for two years,” Leo explains, “and, secondly, while that has been the tradition in politics, it doesn’t necessarily have to be. Equally, might you be unwilling to make another kind of generational shift by not bringing your boyfriend to these events? If you become Taoiseach, Matt’s life will change as much as yours will. His other sister, Sophie, told me earlier from London that Leo “always had a very strong feeling of family. He is still close to his Dungarvan family, too”. Would Leo like to have a family of his own and be a father one day? Another eternity of a pause. “Matt is just a very special person. Someone who is unconditionally on my side, which is always great. He is the kind of person who has made me a better person. I know I sound like bloody Jack Nicholson in As Good As It Gets, but it’s true!” Leo laughs. If you had kids, would you want them to follow you into politics? “Oh no,” Leo says emphatically. “Oh no.” Miriam, how did you feel when Leo decided to go into politics? “I wasn’t terribly happy with him going into politics,’’ she replies. I ask his mother, was she worried when Leo told her he was going to reveal his sexuality to the nation on Miriam O’Callaghan’s radio show in January 2015. If the vote goes against you next Friday, and you lose the leadership contest to Simon, how will you feel? “Disappointed, very disappointed, obviously,” he answers. Did that stoicism come from his parents? Leo: “It is a job that I would love to have. It is something that I would love to do. I think I have a lot to offer. But I don't think I'm entitled to it."